The Swedish Ice Hockey Federation revealed Thursday the selection camp roster of players who will compete for spots in the upcoming 2014 IIHF World Junior Championship in Malmo, Sweden. Sweden earned a silver medal at the 2013 WJC after a 3-1 loss to the United States in the gold-medal game in Ufa, Russia in January. The country's dramatic 1-0 overtime victory against Russia in the 2012 WJC gold-medal game put an end to 30 years of championship futility in the event. Goalies: Marcus Hogberg, Linkopings, SWE (Ottawa); Jonas Johansson, Brynas, SWE (2014 draft eligible); Oscar Dansk, Erie, OHL (Columbus). Defense: Robin Norell, Djurgardens, SWE (Chicago); Christian Djoos, Brynas, SWE (Washington); Jesper Pettersson, Linkopings, SWE (2014); Ludwig Bystrom, Farjestads, SWE (Dallas); Linus Arnesson, Djurgardens, SWE (Boston); Arvid Lundberg, Skelleftea, SWE (2014); Gustav Olofsson, Colorado College, NCHC (Minnesota); Robert Haag, Modo, SWE (Philadelphia); Lukas Bengtsson, Mora, SWE (2014). Forwards: Jacob de la Rose, Leksands, SWE (Montreal); Alexander Wennberg, Frolunda, SWE (Columbus); Ludvig Nilsson, Timra, SWE (2014); Sebastian Collberg, Frolunda, SWE (Montreal); Andreas Johnson, Frolunda, SWE (Toronto); Andre Burakowsky, Erie, OHL (Washington); Flip Sandberg, HV 71, SWE (2014); Nick Sorensen, Quebec, QMJHL (Anaheim); Gustav Possler, Modo, SWE (Buffalo); Edwin Hedberg, Modo, SWE (2014); Erik Karlsson, Frolunda, SWE (Carolina); Anton Karlsson, Frolunda, SWE (2014); Lucas Wallmark, Lulea, SWE (2014); Oskar Sundqvist, Skelleftea, SWE (Pittsburgh). While Sweden missed its chance to become the first country since Canada (2005-2009) to win back-to-back gold medals, the players and coaching staff are looking forward to hosting the event this year. Sweden coach Rikard Gronborg will take 26 players to training camp from Dec. 16-23 in Ängelholm, Sweden, before announcing its 22-man tournament roster. Gronborg has nine players from last year's team: Goalie Oscar Dansk (Columbus Blue Jackets) of the Erie Otters of the Ontario Hockey League; defensemen Christian Djoos (Washington Capitals) of Brynas of the Swedish Hockey League, Linus Arnesson (Boston Bruins) of Djurgardens of the SHL, and Robert Haag (Philadelphia Flyers) of Modo of the SHL; and forwards Jacob de la Rose (Montreal Canadiens) of Leksands of the SHL, Alexander Wennberg (Columbus) and Sebastian Collberg (Montreal) of Frolunda of the SHL, Filip Sandberg (2014 NHL Draft eligible) of HV71 of the SHL and Nick Sorenson (Anaheim Ducks) of the Quebec Remparts of the Quebec Major Junior Hockey League. There are 17 players on the roster drafted by NHL teams, including two each from the Columbus Blue Jackets (Dansk, Wennberg), Washington Capitals (Djoos, Andre Burakowsky) and the Montreal Canadiens (de la Rose, Collberg). Right wing Anton Karlsson of Frolunda and center Lucas Wallmark of Lulea of the SHL are two of nine top prospects on the roster eligible for the 2014 draft. Karlsson and Wallmark are B-rated prospects on NHL Central Scouting's November players to watch list. Right wing Edwin Hedberg of Modo is a C-rated skater. 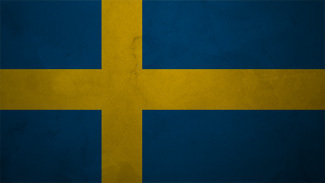 The Swedes will play in Group B at the WJC along with Finland, Russia, Switzerland and Norway. Their preliminary-round games will be played at Malmo Arena.